Troubling reading for all chaotes. Tracing lines of influence between New Thought (aka “positive thinking”), postmodernism, and chaos magick, Lachman shows how the ethos of “Nothing is True; Everything is Permitted” has enabled ideologues of the far right to secure their hold on power. Trump is more directly a product of New Thought, a philosophy which avers that imagining an outcome strongly enough will cause it to materialize (and is probably partly why Trump imagines he is the best at everything), but there is evidence that others who supported him into power – such as Steve Bannon and Richard Spencer – have done so with a more explicit awareness of chaos magick theory, and having employed techniques such as “meme magick”. Lachman’s book is a warning. Chaos magick is its villain. Without an ethical framework, chaos magick techniques can be appropriated by anyone. It is chilling to read quotations from the works of Julian Vayne and Phil Hine (just standard stuff about shifting beliefs, nudging reality; nothing disagreeable) in contexts that illuminate the alt-right’s agenda. Alexander Dugin, aka “Putin’s Rasputin”. Chaotes who do not want chaos magick to become confused with neo-fascism need to wake up. 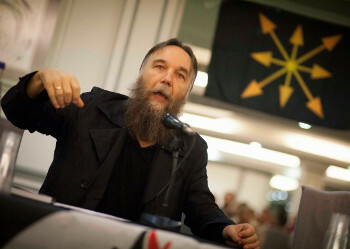 The chaos star is already the emblem of Eurasian nationalism, thanks to Alexander Dugin. The strength of chaos magick is its weakness. Unlike other traditions, it does not tell its adherents what to believe; that would be silly, because adoption of belief is precisely one of the practical tools it offers for changing reality. Consequently, chaos magickians tend to do far more actual magick than traditions that offer a worldview rather than just a set of techniques. But without a worldview there is simply no frame of reference for assessing whether those techniques are used well or responsibly. Consider belief-shifting, which, argues Wahid Azal, can become “the vehicle for self-realization and understanding of the coincidentia oppositorum underlying all phenomena” (Azal, 2016). However, “with Dugin and his acolytes the issue is not linked specifically to any spiritual practice and its realization per se but rather it is purely about political praxis and the will to power in its crudest form” (Azal, 2016). In other words, belief-shifting and its effects are not a means of arriving at a greater understanding of the true nature of a world that can be affected by changes in belief, or the true nature of a self that can turn upon itself in this way, but simply as a means of imposing ego upon the world. Those of us who reject the far right are not necessarily comfortable with neo-liberalism as an alternative. This is where Dugin, Spencer, and their ilk are especially dangerous, because although much is attractive in their criticism of neo-liberalism, everything in their proposals for where we must go instead is skewed from the outset. Dugin wants to resist the dissolution with which liberalism confronts him. But chaos magickal praxis, with its basis in exactly the postmodernist thinking that Dugin wants to defend against, insists that identity is by definition fluid. How can manipulating one’s identity be supposed to make it non-manipulatable thereafter? Retention of identity, from a chaos magickal perspective, could only be in a paradoxical sense of conceding that it never existed in the first place. The “active metaphysics” Dugin ominously calls for, in order to “realise the end of times” (Dugin, 2012: 100), will bring about his desired change of reality through a shift in belief. But in that case reality will be shown to have exactly the fluid, malleable nature that Dugin wants to guard against. Lachman points out the same fundamental contradiction in Richard Spencer and the alt-right, who shift identities and beliefs in order for their meme magick to work, yet at the same time insist “race is the foundation of identity” (cited in Lachman, 2018: 80). Activists of the alt-right, engaging in a spot of meme magick. Seattle, January 2017. Those who are appropriating chaos magick in order to realise the aims of the far right are using tools that do not match their aims. But the tools work, so why worry? This is the problem with chaos magick: there seems to be no requirement to develop understanding. You do not need to look deeper into chaos magick in order to get it to work. Unless you actually want to understand what it is that you are really doing, and who that really makes you. Dugin recognises that the methods he proposes yield a politics that is not what it appears, but he is content to ride with it. As Azal describes this, from the perspective of those even harder right than Dugin, “he has in recent times moved […] into what some neo-Traditionalists would probably characterize as ‘counter-initiatic currents’ and the ‘Counter-Tradition’” (Azal, 2016). Its lack of an ethics or worldview accounts for another oddity of chaos magick that many have highlighted, but none engages with as a glaring flaw: how almost every book on chaos magick is a book for beginners. With the clue in its title, an exception was Alan Chapman’s Advanced Magick for Beginners (2008), which dared to reinstate and re-clarify the Great Work as an obligatory goal for chaos magickians. The methods of chaos magick will most likely continue to be appropriated by and become associated with the aims and agenda of the far right. Unless chaos magick grows up and accepts that a worldview and ethics is an intrinsic part of magickal practice, then it will become subsumed within these movements. 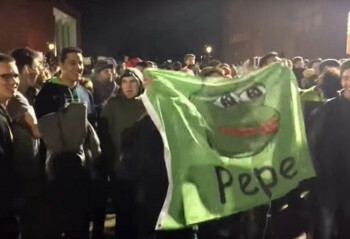 The way to resist is to show the alt-right, and others, how their appropriation of these methods undermines their aims; the fascism produced by these means is self-contradictory and fake. We do this by allowing our own practice of these methods to lead us, through experience, to a deeper understanding of what reality is, and who we truly are. Wahid Azal (2016). “Dugin’s Occult Fascism and the Hijacking of Left Anti-Imperialism and Muslim Anti-Salafism” (counterpunch.org). Alan Chapman (2008). Advanced Magick for Beginners. London: Aeon. Alexander Dugin (2012). The Fourth Political Theory. London: Arktos. Gary Lachman (2018). 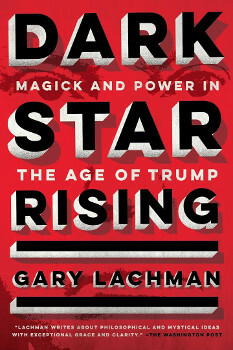 Dark Star Rising: Magick and Power in the Age of Trump. New York: TarcherPerigree. This is parallel to my final personal assessment of Jordan Peterson. Studying his positions I was waiting for a big reason ‘Why’. Some mythological or philosophical stance that upheld his belief system. Turns out, disappointingly, he’s just a conservative. I love reading about the philosophy of the techniques of chaos magic. I have my own views, of course, being a practitioner of the craft. But the technical discussions I’ve always enjoyed. Personally I’ve found CMT to be more congruent with acceptance of others, compassion, and, going even deeper, as you state, wisdom. Now that you point it out, Dugin’s propositions of using postmodernism against postmodernism is a silly head-scratcher. But the more I think about potential violence I become more disturbed by this confused position. Hi Sindder! My experience has largely been similar to yours, but I think it depends upon a crisis coming about, where the magician asks themselves, “Why am I doing this stuff? Why do I need this?”, etc. In some cases, that crisis never comes about, or is fended off, and maybe that’s when problems arise. Magick fails to be seen as a means to explore and examine self, but becomes a prop for the ego instead. I’m not sure that CM presently includes the values and techniques that are needed to ensure as far as possible that the inner journey is triggered is pursued. But that’s certainly not due to lack of effort on your part! Many thanks for drawing attention to my book and the connections I make between elements of New Thought, chaos magic, and the rise of a new occult politics among the far-right. I would like to state here, as I have in my talks about the book, that I do not wish to stigmatize chaos magic or magicians and certainly don’t hold them responsible for what others make of it. I doubt Trump ever heard of it and I suspect that most chaotes would not be in sympathy with his aims or that of other political chaotician. You are in good company however; Nietzsche was misappropriated by the far-right too. Thanks, Gary. That was certainly my understanding of your intention also, as I read the book. I think the book is a timely warning, and a vital heads-up to all chaos magickians who would prefer not to be associated with the far right. As you demonstrate, chaos magick (CM) has much in common with certain strands of post-modernist thinking that the right has mobilised to further its aims (albeit in a self-contradictory fashion). In that sense, I see CM as being at fault here; it’s currently wide open to being hijacked. It’s not good news that you’ve broken, but thanks for breaking it! Put ethics and moral on something that breaks ethics and moral… Chaos you still amaze me. There is no “outside” to ethics and morality, I would argue. Chaos magick takes a certain position with regard to these, but it cannot dispose with them entirely, because it takes its position on the basis that it is good, or better than the alternatives. And so we are seeing the consequences of its attempt to “break” ethics and morality. Yes Chaos Magic has become appropriated by the Right, partly in response to its appropriation by the Left. Ritual Incantations that constrain conscious and subconscious thinking – Politically Correct ‘Thoughtspeak’.